Selenium (Se) is required at a fundamental physiological level in all animals. Adequate levels of Se are necessary for proper bone metabolism, iodine metabolism, immune function, reproductive success, and recruitment. Selenium is a component of enzymes which scavenge oxidative free radicals that would otherwise degrade cell membranes. Severe deficiency results in obvious symptoms such as white muscle disease in ungulates. However, more frequently, deficiency may be chronic and subclinical. Individuals then display no obvious signs of malady, yet performance suffers until their populations decline without apparent cause or through proximate factors which obscure underlying primary factors. Although well known in domestic stock, the link between population performance and Se deficiency in wild populations has been difficult to firmly establish. Confounding factors include the role of vitamin E, which also acts as an antioxidant to mitigate the need for Se under some circumstances; changing Se requirements at changing times in animal life history; changing Se requirements in relation to pollution levels and other factors causing oxidative stress; and the non-uniform distribution of Se in its various chemical forms in the environment. The latter point is especially important to wild populations that have been reduced to remnant portions of their previous range. 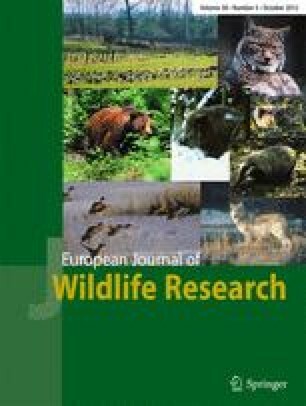 Here, we have reviewed the literature of Se in wildlife as well as provided an introduction to Se in physiology and Se behavior in the environment for the wildlife researcher and manager. We conclude that unrecognized Se deficiency may often impede optimal population performance, and we provide recommendations for habitat analysis with regard to Se which can be used in future research. Finally, evidence that the amount of available Se in the environment is decreasing from anthropogenic causes is shown. We greatly appreciate the many constructive comments from three anonymous reviewers.